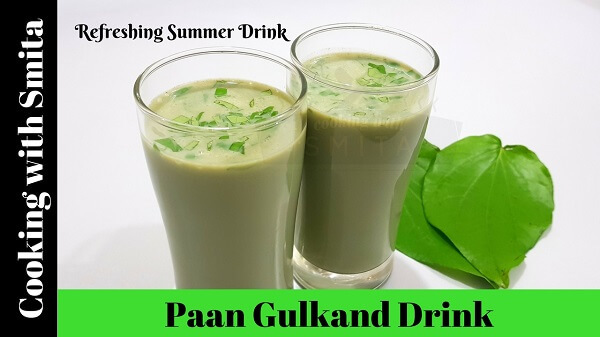 Summer is here in India, so today I am sharing a refreshing summer drink – Paan Gulkand Drink recipe, also known as Paan Shots to keep the body cool during hot summer days. A simple and instant method requires very few ingredients – Milk, Rose Petal jam (Gulkand), Fennel Seeds and Betel Leaves. Gulkand is an excellent cooling ingredient also recommended in Ayurvedic medicines. 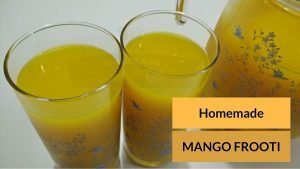 I often make this drink at home during summer, and everyone including kids love it. Follow this step-by-step recipe to make Paan Gulkand Drink at home. Rinse Betel Leaves in fresh water, dry and finely chop them. Add chopped Betel Leaves in a blender, also add Gulkand and Fennel Seeds (Saunf). Add 1 cup chilled Milk and blend until smooth. After blending, keep the mixture in the refrigerator for at least 30 minutes. After 30 minutes, add remaining 1 cup chilled Milk in the mixture and blend again. Sieve the mixture through a fine strainer. Paan Gulkand Drink is ready to serve. Pour the Drink into serving glasses and add some chopped Betel leaves on top. You can also add Rose Syrup or Rooh Afza. If you are not adding Rose Syrup or Rooh Afza, you can also add 1 tsp. Sugar to make it sweeter. You can make Paan Shots in advance and keep in the refrigerator, consume within 3 – 4 hours.